Earlier today, all the competitors in the World Heavyweight Championship arrived. Renee Young introduces the panel for the show and Tom Phillips in the Social Media Lounge. He’ll be joined by Tyler Breeze and Summer Rae later. Video package of Rollins getting injured and the results of the title tournament so far. The panel discusses the huge opportunity awaiting the men in the title tournament and watching history unfold. Earlier today, Byron Saxton asks Roman Reigns about his refusal of Triple H’s offer to go straight to the tournament finals. He doesn’t regret it. Byron Saxton is scared of either Kevin Owens or Dean Ambrose winning the title. He wants some “vanishing powder and a rock to hide under.” Booker T makes a football reference. Graves would like to see Saxton replaced by a hamster wheel. WWE.com exclusive where Owens talks about doing crazy things. The panel picks who they think will win the title. Graves picks Owens, Saxton picks Ambrose, Booker picks Reigns. Renee picks no one. I’m going to say she picks Del Rio just so he doesn’t feel left out. Video package of the Diva’s title feud between Paige and Charlotte. Saxton talks about Charlotte living in Flair’s shadow. Booker T says the match will be a harding/Kerrigan situation. Rich Brennan welcomes Charlotte and asks what we can expect. Charlotte regrets losing her cool on RAW. Goldust and Stardust start off, but after taking a few punches he tags out. Viktor comes in, takes a powerslam, and is pinned. Konnor and O’Neil trade some shots with O’Neil getting the clear advantage. The Dudley Boyz double team Konnor and call for tables. Before they can get any the rest of Konnor’s team comes in only to get thrown back out. Neville performs a running dive onto the group. Konnor is in control of Bubba Ray after the break, that is, until a side slam from Bubba puts Konnor out of the match. D-Von is tagged in and he immediately gets isolated in the corner of the opposite team. D-Von eventually gets Stardust down and tags in Neville. Neville is hyped up and uses his speed to overwhelm Stardust. Dallas gets a blind tag and hits a Bo-dog, Miz also gets a blind tag and hits a Skull Crushing Finale. As Miz is celebrating Goldust enters the ring and rolls him up with a schoolboy. Miz is incredulous. He leaves and Stardust gets a quick advantage on Goldust. Bo Dallas is in control of Goldust. Stardust tags in and continues to dominate his brother. Goldust gains a little space with a sunset flip and tags in O’Neil who powers of both Stardust and Dallas. Bubba Ray and Goldust perform tandem Dusty Rhodes punches, then O’Neil hits Clash of the Titus on Bo Dallas. Finding himself alone, Stardust tries to take a walk only to be stopped by O’Neil. He backs up into Goldust and throws an elbow that he immediately apologizes for. He’s chased into the ring and finds himself in 3D. The panel is pumped, but Booker T can’t hear. Renee throws it over to Tom Phillips. Tom Phillips asks some dumb questions to Tyler Breeze and Summer Rae. They fail to understand that he didn’t write the questions. It’s a little weird. Tyler Breeze continues to live his life. Also, “everything is everything” (Summer Rae, 2015). Saxton says Bray Wyatt is envious of The Undertaker. Graves says it doesn’t matter who will face The Brothers of Destruction. They’re all powerful. Booker talks about the coming apocalypse in this mug. Saxton is thankful for the kickoff panel. Corey Graves is thankful for being close to seeing the Undertaker on his 25th anniversary. Booker T is thankful for waking up. Renee isn’t thankful for anything. Video package of the Wyatt/Undertaker feud. It’s a kickoff show so there’s not a whole lot to say, but it was an entertaining enough way to pass the time until Survivor Series Starts. The one match on the show was fun and long. The only issue I had wasn’t with the show itself, but with the WWE Network. I had the network on before the show started, but the feed stopped as soon as the Kickoff was supposed to come on the air. I looked around and saw many, many other people with the same issue. I actually watched the first few segments on YouTube while WWE figured things out. The network feed started working again about 20 minutes into the show and I had absolutely no more problems after that. 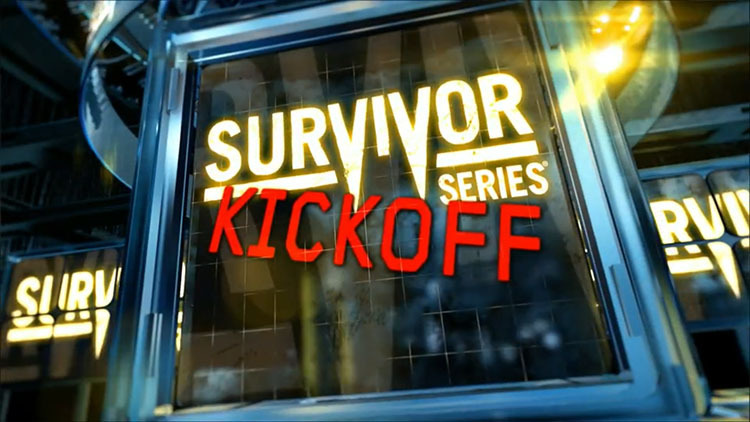 But yeah, excited for Survivor Series! Continue on to see my recap of the main show!